Late To The Party #2: Ridge Racer Type 4 on PSone. It's a genre that's constantly evolving. While two-dimensional platformers and puzzle games remain fairly time-less — racing games evolve. It's funny, in fact, that I should return to the original PlayStation's Ridge Racer Type 4 just days after getting a hands-on with Sony's upcoming Gran Turismo 5. Despite there being little more than ten years difference between the games, the contrasts could fill a novel. Purely on a technical standing, the difference between Type 4 and GT5 could form the basis of a thesis on the advance of computing technology. But it's also an obvious transition - graphics improve over time and I'm not here to write about that. Ridge Racer Type 4 opens with a typically lavish introduction. It's a bit of a staple for the Ridge Racer franchise. There's a pretty lady walking in the middle of nowhere. Apparently, Namco wants you to believe that pretty ladies walk through scenic settings in Versace dresses and elegant stilettos. Y'know what though - I think Namco are trying to make a point in the intro for Ridge Racer Type 4. Sure, this lady may be dressed up like a Bond girl, and sure she may have the wrong choice of shoes for walking, but hey, let's assume these shoes cost about £400, right? Possibly more? Well guess what - they break. It's almost like Namco are saying — "If you're a lady watching this cut-scene, and you plan on going hiking in expensive clothes, don't." Having watched the full cut-scene though, I kind of hope Namco aren't trying to send out cryptic metaphors. See, while this lady fornicates with her shoe, a high-performance sports car bombs past and halts a few metres up the road. The lady, now barefooted, walks up to the car and peers into the window. Hmmm, fornication indeed. But there's no time to dwell on the subject — the screen flashes to white, as an ambient, delayed voice screams out "Ridge Racer Type 4". It's stunning how the act of simple speech processing can bring memories flooding back. Think about the announcement of a title in an arcade game though; it's not simply the decleration of the game's title, it's the post-processing effects that make it nostalgic. It's "Ridge-dge R-Racer Type-pe Four-ur" right? You know where I'm coming from. 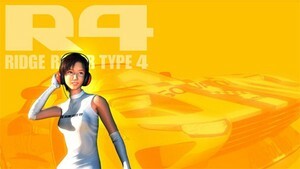 Ridge Racer Type 4 was the first PlayStation game in the franchise not to be based on an arcade cabinet. It also happened to be the last Ridge Racer game to launch on the original PlayStation. Ridge Racer V followed it, and that was a PlayStation 2 exclusive. The game's main draw is it Grand Prix Mode. This is split up into three heats across eight races. Incredibly, you get to pick a racing team based on a classic Namco franchise. There's no Ferrari or Lambourghini in Ridge Racer Type 4 - nuh-uh. You choose from the Pac Racing Club or Dig Racing Team. There are two other teams on offer based on Xevious and Mappy, but who's honestly not going to pick the Pac-Man team? Upon joining the team, we're greeted to some dialogue from team-leader Shinji Somethingorother. I forgot his surname — but that's ok because he's a jerk. The punk thinks I'm not up to the job. I don't know, maybe this guy thinks I'm a really terrible driver, or maybe he's just a jerk. Either way, as the team leader you'd think he might want to encourage me to do well in my first race, wouldn't you? Apparently not. Taking to the track is a dithered mess of jagged lines and clunky polygons. It really is amazing how far video game technology has come in such a short period of time. Surprisingly, Ridge Racer Type 4's still distinctly playable. The frame-rate hovers around the 30FPS point, but the controls are fairly responsive for a racing game of its era. The biggest problem with the gameplay is the way the actual racing plays out. You never feel like you're racing a pack of cars, instead you're against one at a time. That's certainly a limitation of the PSone's hardware, but it's a killer to the gameplay. You have to be perfecting laps to ever get a chance at tussling for first-place. The AI's surprisingly smart and aggressive for a game of this age though. It'll jostle for position, try to block off over-taking routes, and occasionally bump you in hope of watching you spin-out. The drifting's always been the key component in Ridge Racer games, and while there's an option to turn it off and opt for something a little sim-based, I recommend you don't. That element of over-steer that's pivotal to the franchise is still as richly rewarding as it was during the franchise's inception, and while steering with the D-Pad can be a challenge at times, the game does have DualShock support to make the drifting even more enjoyable. The track's are filled with cliche arcade attempts at showboat set-pieces. As I enter a tunnel, a jumbo jet zooms over my vehicle. Likewise, as I race to the finish-line, a helicopter decides to hover over the track in front of me. It's needless showing off, but it's still got that charm of an old technology being pushed to its limits. I finish first-place, and Shinji Nosurname has to eat a large slice of humble pie. A giant Pac-Man truck drops by and delivers my first new car. Amazingly there are over 320 cars in Ridge Racer Type 4, but you have to seriously grind to unlock them. I'm told that if you unlock all 320 cars you unlock a Pac-Man shaped vehicle, but I'm not yet sure I believe it. I could imagine trying back in 1999 though. I kind of miss the time when the reward for playing a game wasn't a new level in Call Of Duty, or the satisfactory pang of a new trophy. It was something ridiculous, unattainable but equally sought after — the Yoshi on top of the castle, the bicycle taxi... the Pac-Man car. Totally useless, totally pointless, but at least you could say you'd seen it running on your own TV. Late To The Party is PushSquares retro games column, where editor Sammy Barker returns to a classic PlayStation franchise with the luxury of hindsight.